2006 Honda Civic Pros and Cons | Page 1 of 1 | Why Not This Car? What drives people to buy (or not buy) a certain car? 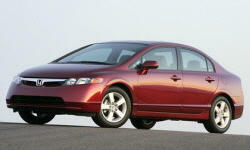 TrueDelta's members share 2006 Honda Civic pros and cons based on their real-world driving experiences. i remember when this body style was new, and I have always wanted one. It is a reasonably sized car with a very good fuel efficiency and good response of the powertrain. I found nothing attractive about the exterior design, homely and odd-looking from every angle. Advertised as 50 MPG/Gal (Imp) best we ever got was 42 MPG, I asked when we got the car new what the "real" gas milage was and salesman swore it would get 50 MPG?!?! Cheap. Got it used from dealer for 16,000 w/only 3,000 miles on it. I think it looks very modern / sleek..
Had an Accord, and liked that experience. The experience continues with the Civic. Very futuristic styling, terrific looking belt line. I like that the hybrid looks (pretty much) like any other civic. Radical and futuristic, two-tiered gauge display with a digital speedometer is hate-it-or-love-it. Quality of design and assembly is superb, soon to be timeless; not many cars have pulled off tasteful digital gauges. More road noise than I like. I had it under coated from new and it is still pronounced. Maybe the tire brand? Poor materials used and car creaked and rattle every bump in the road. The Honda Civic has been a leader in its class for decades. A Consumer Reports top choice for years and a well reviewed car by respected automotive publications, the Civic has built a solid reputation. The coupe is a great looking car, with long doors that make getting in and out easy.